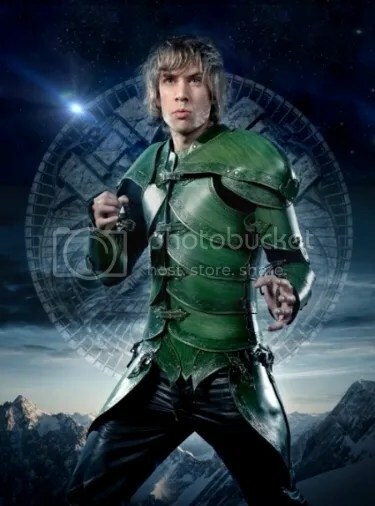 Thomas Winkler is the vocalist of Gloryhammer, the Power Metal side project of Alestorm‘s Christopher Bowes. The band have just released their debut album Tales From The Kingdom Of Fife and Ian caught Thomas for a quick chat about the album amongst other things. Ian: How did you decide on the name Gloryhammer ? Thomas: The name Gloryhammer expresses in an emotional way the fundamental essence of our band – Heroic Fantasy Power Metal. A hammer is heavy and able to smash the heads of goblins and trolls. So it brings glory to those who use it for the good fight. And besides, Gloryhammer is easy to find on Google. Ian: Which bands would you say are Gloryhammer‘s biggest influences ? Thomas: All the cheesy Epic Power Metal bands of the early millennium. Plus Elvis Presley. Because he was an extra-terrestrial. You will find out what I mean when we release our second album. Ian: The band have just released their debut album Tales From The Kingdom Of Fife, how has the album been received by fans and the media alike ? Thomas: I read a lot of reviews and reactions of fans which was pretty entertaining. I also do like the very negative ones. At least as long as they are only a small part of the overall reactions. Some media did’nt realize the idea behind Gloryhammer though, and we were expecting that. Because it needs a certain sensitivity to understand the complex meaning of the lyrics and the story. Ian: What is the main concept of the album ? Thomas: It’s about unicorns. Undead unicorns of war. But they once were good and just went mad because of some evil sorcerer dude, called Zargothrax. He hates the citizens of Dundee, which once was a Kingdom in Fife, Scotland. So we tell about Scotland. And we’ll also go into space with the next album so there is certainly something for everyone in this mighty concept. Ian: With the members of Gloryhammer been from different bands and in different countries, how did you find the whole recording process for the album ? Thomas: I only met the other guys once before in London for a photo shoot so it was kind of an experiment how it would work in Luebeck/Germany when I had to sleep in a small and (at least after some nights) smelly room with some constantly horny young men. But luckily with Lasse Lammert we had a great host and also very capable producer so I forgot about these circumstances with time. And to say the truth, we had a superb time and I’m happy that Zargothrax didn’t assault me at night ! Ian: Have Gloryhammer got any plans to go on tour in support of the album, if so, where can fans expect to catch the band live ? Thomas: Yeah, we’ll be on tour by the end of the summer. The first ever show will be on a very well-known festival which takes place in July in Tolmin/Slovenia. I am not supposed to tell you which one yet. But it’s said to be beautiful, especially because of a lake and the woods. A propos: the woods are a good thing. I will be able to hide by wearing my armour. That’s really cool, I think. Ian: A question I’m sure fans must have. Is Gloryhammer and the Tales From The Kingdom Of Fife album a one off or can fans expect to hear more from the band ? Thomas: As mentioned above, there will be another album and the story will be settled in space in the year 1992. According to Chris there will be a total of 21 albums until Gloryhammer is history. Ian: If you could replace the soundtrack to any film with your own music, which one would it be and why ? Thomas: I wouldn’t replace a film soundtrack but the soundtrack of a video game. Since I am a big fan of The Legend of Zelda and its music, I wouldn’t replace that one. Rather I would replace the original Tetris soundtrack. I can’t stand this one because it’s so catchy. Ian: Have you got any words for our readers ? Thomas: May the Force be with you, for the Glory of Dundee ! Gloryhammer‘s debut album Tales From The Kingdom Of Fife is available now via Napalm Records. This entry was posted on 17th April 2013 at 10:56 am and is filed under Featured, Interview with tags Alestorm, Dundee, Fife, Gloryhammer, Napalm Records, Scotland, Thomas. You can follow any responses to this entry through the RSS 2.0 feed. You can leave a response, or trackback from your own site.